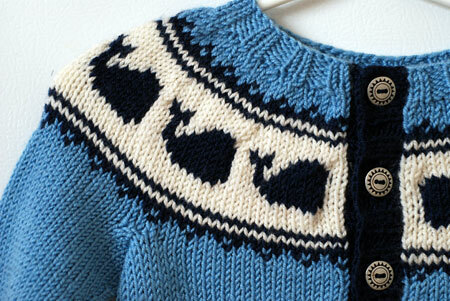 Pattern: Pod of Cetaceans Cardigan by Elinor Brown. Yarn: Louet Gems sportweight, 100% superwash merino. I used a 100 gram skein of Neptune (15) almost in its entirety. 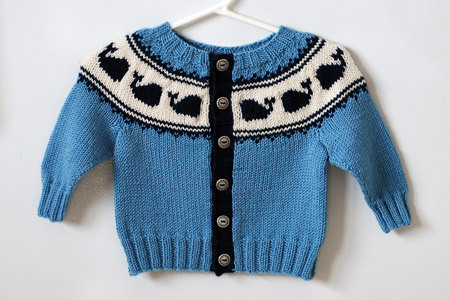 In fact, I ran out of Neptune when time came to knit the button band, so I ended up making it using Indigo (16). Cream (30) was the third color. It seems to me that both Neptune and Indigo have been discontinued, which is not surprising – I have had these skeins forever! Well, at least since April 1st, 2006. 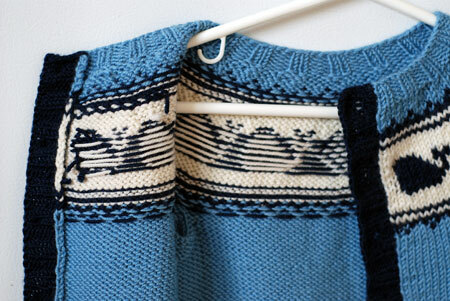 Which reminds me – this project used 100% stash yarn! Go me! Longtime readers of the blog will remember that Louet Gems merino is one of my favorite yarns. I started using it early in my knitting career because it was very approachable to a beginner knitter – big skeins, many colors, good price, nice feel, superwash… And I continue to stick with it because I’ve always had excellent results when using it. Not surprisingly, it was not difficult to find three complementary colors in the stash to knit this little sweater :). For me, the two properties of this yarn that are most noteworthy are: first, it knits to a true sportweight gauge, perhaps even a little bit heavier. Using US 5 needles, my gauge is consistently in the 5.5-6 spi range. Maybe it’s just me, but many self-proclaimed “sportweight” yarns knit to 7 spi in my hands, which is a lot more knitting than I want to do when I’m using a “sportweight” yarn. Second, it has fantastic stitch definition. Crisper than a mercerized cotton. I say this with a caveat, though. I think at some point Louet changed their mill or base yarn or something. I find yarn in older skeins to be much more plump and crisp than yarn in recently-purchased skeins. I especially noticed this when I was knitting Walter’s Komi hat, in which I used all kinds of Louet, old and new. Fortunately, this little sweater is all “old” yarn, so the stitches are as plump as can be! 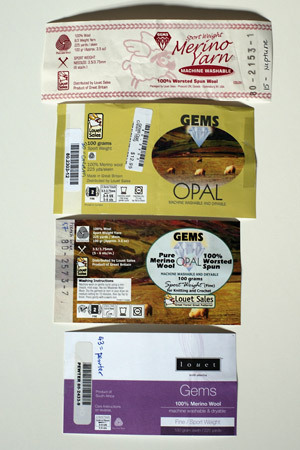 Evolution of Louet packaging, oldest on top. Yarn wrapped with the top two labels is always plump-tastic! I’ve seen the third label on both plump and stringy yarns. The fourth one has been somewhat disappointing so far. Needles: Susan Bates circs, US 3 for the ribbing and US 5 for the main part of the sweater. My gauge was about 6 spi and 8 rpi. Finished size: About 20″ across the chest, 11″ from hem to shoulder, and 5.5″ from cuff to armpit. This size is in the 3-6 months range. This project was an instance of following the intent of the pattern more than following the pattern itself. My yarn had a completely different gauge, and I didn’t knit the cardigan in the round and steek. So, I had to re-interpret all the directions, charts, measurements, etc. It wasn’t a big deal, though – it’s a baby sweater! Even when I totally messed up the yoke section (looked at the largest finished dimensions instead of the smallest), and had to rip out both button bands, the collar, and part of the yoke, it only took a few hours to get myself back to where I started. The yoke is still a little bit misshapen because I didn’t want to completely re-knit it: that would necessitate fishing out all the ends I so painstakingly wove in – major ugh. But I’m told little babies are misshapen, too, so everything should work out just fine :). Just like when I knit the Archie Vest, I didn’t find stranding on both right and wrong sides of the fabric to be in any way annoying. There were maybe 10 rows of it, total? No big deal. I completely omitted all the optional duplicate stitching, so there were even fewer floats and ends to weave in. The inside is fairly tidy, I think. Confession: with all the baby knitting around these parts, I’ve acquired some baby hangers specifically for ease of photographing the little projects. And when I say “acquired,” I mean pilfered from a neighbor’s recycling bin on garbage day. Since I’m in a confessing mood. The silver-tone buttons are from Winmil Fabrics. I knew the button band would be navy when I picked them out, and I think they stand out against it very nicely. 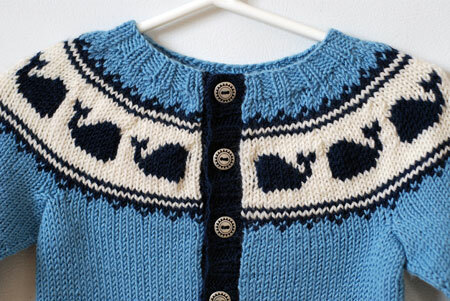 Had I had enough yarn to knit the button band in the same light blue color as the rest of the sweater, I think I would have used navy-colored buttons. 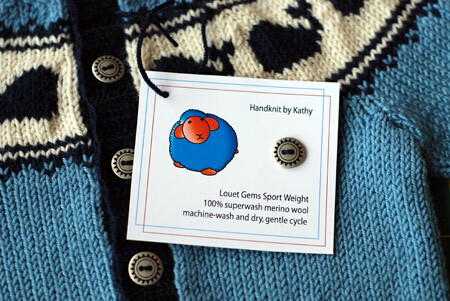 And, of course, a little gift tag so the mom knows how to wash the sweater! (Plus a place to stick the spare button.) Next time I might even wind a little extra yarn onto the tag, as Nikki so cleverly did here. This photo of the tag reminded me of one last thing: someone e-mailed me and asked whether I had any tips about closing up the armpits on this type of sweater. In fact, I do. In addition to sewing up the obvious hole, I also weave the yarn behind several of the stitches on either side of the armpit. Basically, if a stitch looks loose, I “duplicate stitch” it on the wrong side to tighten. Works like a charm! I want this sweater in a big girl size! I would wear it all the time. Those whales are so cute! Cuteness overload! I absolutely love the yoke with the whales. I think this one may be the cutest one of the baby gift knitting this fall! What a wonderful finish – I’m sure the sweater will be worn and treasured! And good for you for “acquiring” the hangers – that’s good re-using at it’s best!! Wonderful sweater! Love your blog. Love the whales. Very much agree the Gems yarn not full of the same glory. Glad to hear stranding on the purl side isn’t too bad. Very cute, and the buttons on the navy band are lovely. Adorable! I need to get cracking on some baby knits. This sweater is just. too. cute. I adore it. I am loving all these little sweaters and vests you are making! So cute! What a great little sweater. Those whales are just fabulous. Very cute sweater! I like your color combo. I wish I hadn’t clicked onto Elinor’s site, though. Now I want to order almost all of her patterns! ack! so cute! I also love the idea of putting the extra button on the care tag. So useful! That is wonderfully adorable. I love all kinds of sea creatures, so now I want to make this though I have no babies in my life! Whooooosh! (That is the sound of a congratulatory whale). This is so cute! I’m a huge Louet Gems fan too. The stitch definition alone (ok, and the superwashiness) is reason to use it. I LOVE love love that sweater! The little whales are too cute. And I would never have known that the navy stripe wasn’t intentional unless you mentioned that you ran out of yarn, I think it adds a nice touch. Wonderful job! Those buttons are absolutely perfect. This is just so very darling. I want to make one just for me to have. Great work and photos. So awesome!!! I think the navy bands are perfect. Thanks for a little yarn-y history too. Those old labels are so cool. Pretty cardigan! Love the choice of colors. That seems indeed like an incredible yarn… Love the tag you made! Lovely sweater! I like multicolor patterns, too. This brings me to a question I wrestle with: Do you have a good test for checking colorfastness before you buy a yarn? Did you test if the black or blue will bleed on the white? Or do you have brands that you know have colorfast colors? It’s sick how cute that sweater is. Usually whales make me feel some sort of adolescent wave of cold sweat, reminding me of the chinos with the embroidery on them, not so these ones. Lovely. I LOVE this sweater! It really inspires me and makes me want to knit very small things for very small people! That sweater is adorable! I regret to say that I’ve had the same problem with Louet Gems, to the point that I’m looking elsewhere for base yarns to dye.